In the GGL, doctoral projects are embedded in topic-oriented research. Admission is international, and teaching is carried out in the English language. In association with the GGL the medical faculties offer a PhD – MD/PhD programme. 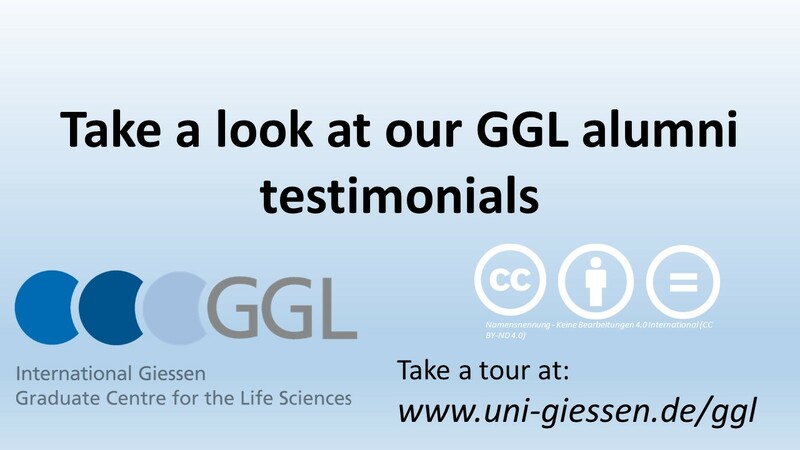 The GGL provides an interdisciplinary, concisely structured graduate programme for all life science disciplines at the JLU, in the fields of Human and Dental Medicine, Veterinary Medicine, Psychology, Biology, Chemistry, Nutrition and Agriculture. In the GGL, doctoral projects are embedded in topic-oriented research sections. Admission is international, and teaching is carried out in English. In addition, the medical faculties offer a PhD programme. Pathways into Life Science Professions is a training and mentoring programme for international and German doctoral candidates of the GGL. During your doctoral studies, you already need to prepare yourself for your entry into the life science job market. It is your chance to acquire profound future-orientated skills! The use of new media in the university can mean many benefits for teachers and students alike. But some questions may pop up: Which possibilities does new technology offer for the support of my teachings? What about legal issues?With our E-Learning Lunch Bag Sessions, it is our aim to offer you help, the possibility for exchange with your colleagues and maybe the inspiration for new ideas. The event will take place on a regular basis, starting upcoming winter semester 2018/2019. intVideo - Ihr Browser unterstützt das Objekt nicht!